The 2018 Sulawesi earthquake and tsunami in astrogeography. Astrology, history, earthquakes and tsunamis: astrogeographical data and analyses. 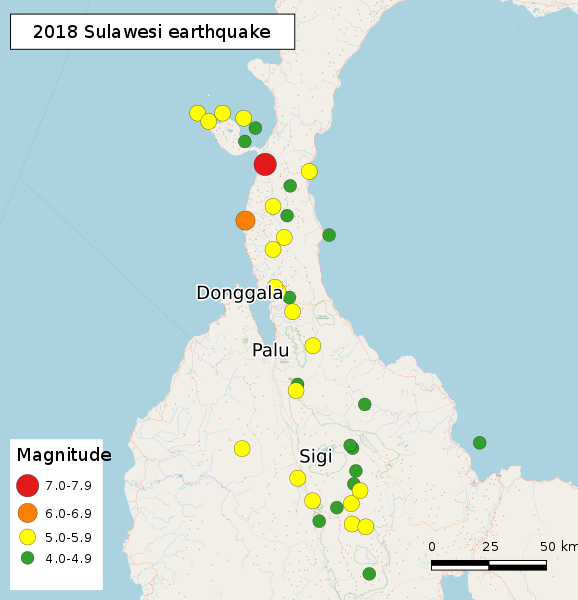 On 28 September 2018, a shallow earthquake struck in the neck of the Minahasa Peninsula in Central Sulawesi and only 3 km from the beach of the Makassar Strait. The epicenter was located at 0.178°S 119.840°E which is 80 km north of the provincial capital Palu. The event was preceded by a sequence of foreshocks, the largest of which was a magnitude 6.1 quake that occurred earlier that day. The combined effects of the earthquake and tsunami led to the deaths of over 2,000 people and many more missing. The earthquake caused major soil liquefaction in areas in and around Palu. This led to mudflows in which many buildings became submerged causing an unknown amount of deaths. Astrogeographic position of the epicenter for morphogenetic field level 1 which defines the international, supraregional resonance and meaning of the event: 28°Capricorn and 5° Aries. The Sun at 5° Libra was exactly opposite the 5°Aries astrogeographical position of the epicenter explaining the gravitational pull from the sun as the major short term triggering factor for the discharge of energies at the epicenter. As the Sun was conjunct the western horizon the forces effected by the sun`s gravitation worked from a western direction. At the same time the tightening pressure from Saturn at 2°56° in his own sign Capricorn the sign of hardest rock material and advancing towards the exact square position to the epicenter seems to have represented a long-term causing factor for the quake. The momentum that seems to have set free the effects of the gravitational pull from the Sun in the rock material deep in the ground were the simultaneous transit of Mars at 5°Aquarius in exact trine to the Sun and in sextile to the 5°Aries coordinate of the epicenter. The conjunction of Mars, South Node and Lilith between 3°and 6°Aquarius could stand for issues of long term imbalances, tension and stress within the ground structure at the Palu-Koro Fault. 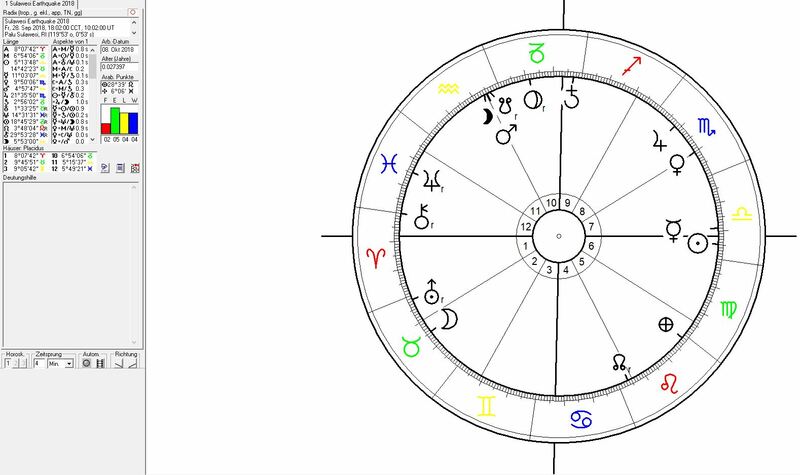 The astrological constellation that corresponds with the tsunami as well as the soil liquification effect is the trine of Neptune the ruler of the ocean and sea water at 14°Pisces with the midpoint (15°Scorpio) between the positions of Venus at 10° and Jupiter at 21° both in Scorpio the sign of mud. swamp and marshland. This trine appears to have turned out as a supporting aspect for the soil liquification effect. Palu the capital of the province of Central Sulawesi is situated on a long, narrow bay and valley at the mouth of Palu River. Soil liquification occurred in two areas: an area of 1000 m x 1500m in the Petobo neighnourhood and 500 m x 800 m area in the Balaroa neighbourhood stretching between Gemini and Cancer and between Scorpio and Sagittarius. See the satellite images of the affected areas here. Astrogeographical position of the City of Palu for morphogenetic field level 2 which describes the energetical topics and atmosphere of the whole of the town area itself: the town of Palu has the astrogeographical longitude coordinate in water sign Pisces sign of the sea and the most important astrological factor of destabiliization. The coordinate for the astrogeographical latitude strectches through the 2nd half of dynamic fire sign Sagittarius with the south end of the town on the first degrees of Capricorn lying higher than the town itself. This is only natural because Capricorn as the sign of mountains and indicator for more solid rock fromations in the ground is often higher and simply more solid than its neighbour Sagittarius. The incoming tsunami waves seem to have gotten as far as the south end of town (which is about 6 km inland through the river bed and possibly also underground rivers. Astrogeographical position of the two locations that were affected by soil liquification which completely swallowed all buildings causing very high numbers of casualities for morphogenetic field level 3 which describes the energetical topics of the area itself: one of the two areas was of 1000 m x 1500 m in the Petobo neighbourhood at the south end of the town is located in Aries and between Libra and Scorpio. The other is a 500 x 800 m area in the Balaroa neighbourhood located between Gemini and Cancer and between Scorpio and Sagittarius.